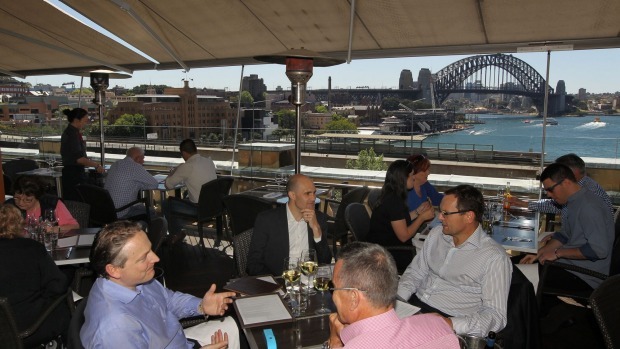 It's such a big Sydney hit – the harbour, the ferries, the bridge, the house, the cruise ships, right down to the Jeffrey Smartness of the Cahill Expressway. A lot of restaurants have great views, but this? The view from the terrace at Cafe Sydney isn't looking down from on high, it's front row at the show, and you're practically a part of it. If you don't believe me, there's always Live Cam. Head to to the Cafe Sydney website and you'll find it under "gallery". Yes, I know what you're thinking, you can't eat the view. So what can you eat? Good question, especially with the recent appointment of executive chef James Kidman, who was with Otto for eight years before doing some high-profile consulting in Canberra and Sydney. In truth, Kidman's new menu is not dissimilar to the one I ordered from here 18 months ago, and is designed to appeal equally to business lunch types and tourists. Now, as then, the linchpins are the freshly opened oysters and anything from the tandoor oven, established from day one, 15 years ago. There's still the giant seafood share platter, crumbed crab cake, crisp Berkshire pork and tandoor-roasted ocean trout; the changes being more in presentation and composition. Under the heading (mine) of Never Ignore The Obvious, the daily special of briny, fleshy Gold Band Little Swanport oysters from Tassie ($5.50 each) is a must. And sea-worthy little vessels of flavour they are, plumped up with chardonnay vinegar, cucumber and pearls of salmon caviar. 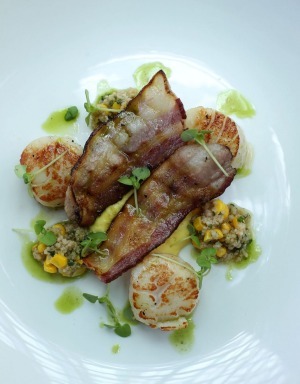 A classic blonde-on-blonde entree of grilled scallops ($27) is updated with the addition of farro (an ancient type of wheat), corn shaved straight from the cob, a silky little corn puree, and folds of Adelaide's dry-cured Skara bacon, making a perfectly pitched, summer-friendly dish. Beef carpaccio ($27) is another modern classic, with its zig-zag of aioli, showering of baby basil, and spindle of house-baked grissini, Made with 5+grade wagyu, it's rich, mouth-filling and heavily marbled. I can thoroughly recommend adding a sneaky side of the puffy naan bread fresh from the tandoor ($3), and piling the raw beef on top. Lunch is corporate, with a good mix of two-tops and larger tables, and everyone's out to enjoy themselves. An on the money wine list comes with a spotlight on natural wines and local labels using lesser-known European grape varieties, such as the clean, crisp 2013 CRFT gruner veltliner from the Adelaide Hills ($15.50/$71). Main courses are solid and business-like, with no surprises on a plate of grilled swordfish with slow-roasted tomato, potato gratin and olive tapenade ($38). Decent fish, not overcooked. A heartier dish of boned and rolled corn-fed chicken ($38) with a smooth Jerusalem artichoke puree is good and relaxed, although an accompanying ravioli doesn't really know what to do with itself. It may be time we all moved on from the extraneous ravioli with main course idea. Desserts get more than their fair share of attention, with a special of Pepe Saya buttermilk and creme fraiche pannacotta ($19), served with fairy rings of fresh mulberries, tiny raspberry meringues and a clean, fresh berry sorbet. It looks as if the new chef's brief was not to turn the ship around, but to keep on cruising; making the food offering more consistent without rocking the boat (I have plenty more where that came from, don't worry). Prices are high, but it's a pretty good exchange rate: you pay decent money, get good food, a smart, polished room, mostly pro service, and that view. If you don't believe me, there's always Live Cam.